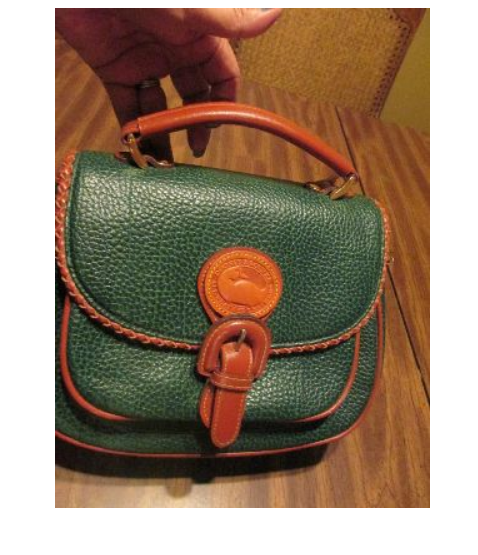 Is this “Surrey Carrier” that I just bought on eBay authentic Dooney & Bourke? If this is of interest to you, can you look over this bag I just won on eBay? It says its tag was cut out of it. 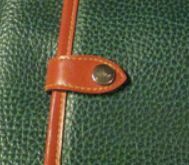 I ask you because I have never seen the style before, and I looked on your site in hopes that its kind is listed in your categorization of vintage bags. I don’t see one and I can’t be sure where it ‘fits’ in terms of categorization, if it does. Thanks for any feedback you have. I’m buying it, not contesting its authenticity to the seller, but I’m just wondering for myself. This is not authentic. 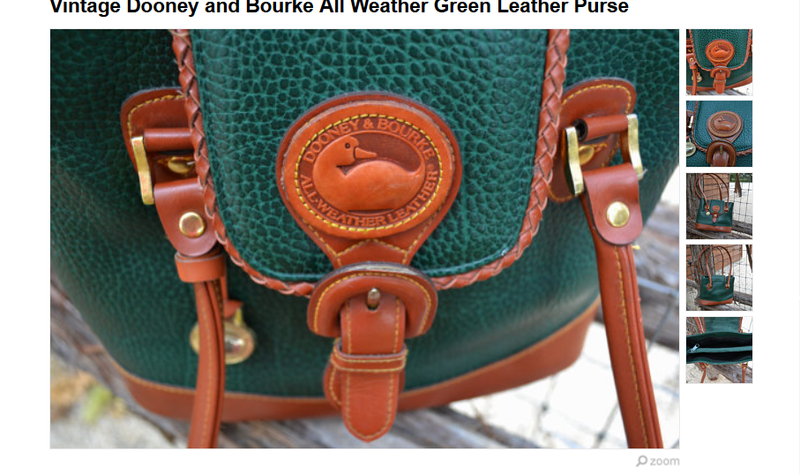 Here are some features that have never been used on Dooney & Bourke bags. Woven piping/trim. 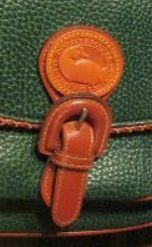 Duck seal attached to another piece of leather which is then attached to the bag. The buckle thingie on the front. Way bad combo of fake features here. The above snap closure which is on the back slip pocket is fake – the authentic bags have a different tab closure (see end of post). The narrow two-tone strap which is riveted to itself and snapped to the bag is not authentic This was the best photo I could get of it off eBay. On further review, this is obviously a fake. I found another one like it on Etsy. I never saw woven piping/trim, the hardware isn’t brass, the zippered pocket inside isn’t tan, and the goofy buckle in front is not DB style. Sigh. Weak moment of mine! Fortunately the other ones I’ve acquired are indeed real DB. That Etsy bag is also a bad knock off. NOW, BELOW IS WHAT AN AUTHENTIC SURREY AND SURREY CARRIER LOOK LIKE WITH SOME KEY FEATURES. 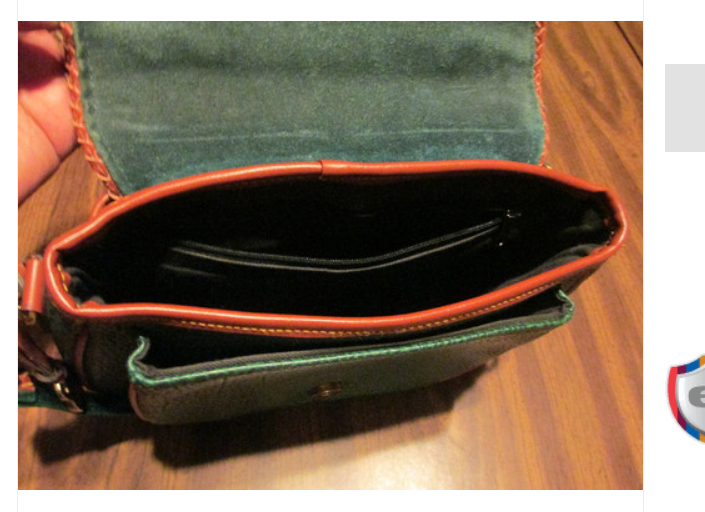 Note the tab closure on the back, the wide, padded two-tone strap and the way the strap attaches to the bag on the sides. 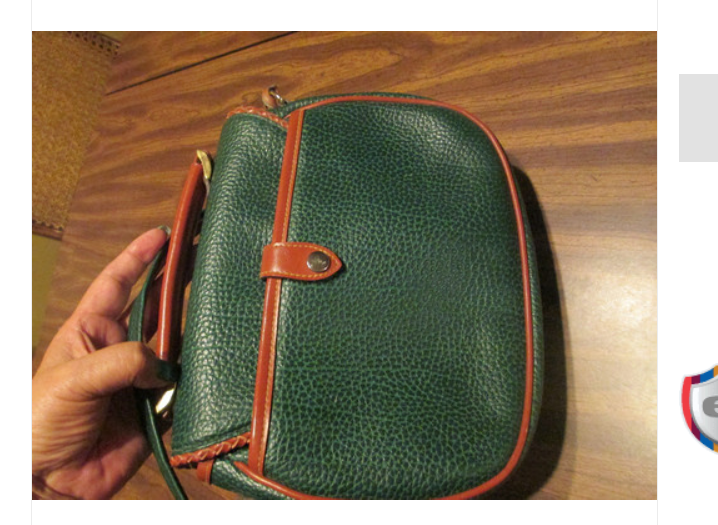 This entry was posted in Authenticity, Carrier, Counterfeit, Fake, Knock Off, Surrey and tagged authenticity, counterfeit, Dooney, Dooney & Bourke, fake handbag, knock off, knock off handbag, surrey carrier by Native American Jewelry Tips. Bookmark the permalink.